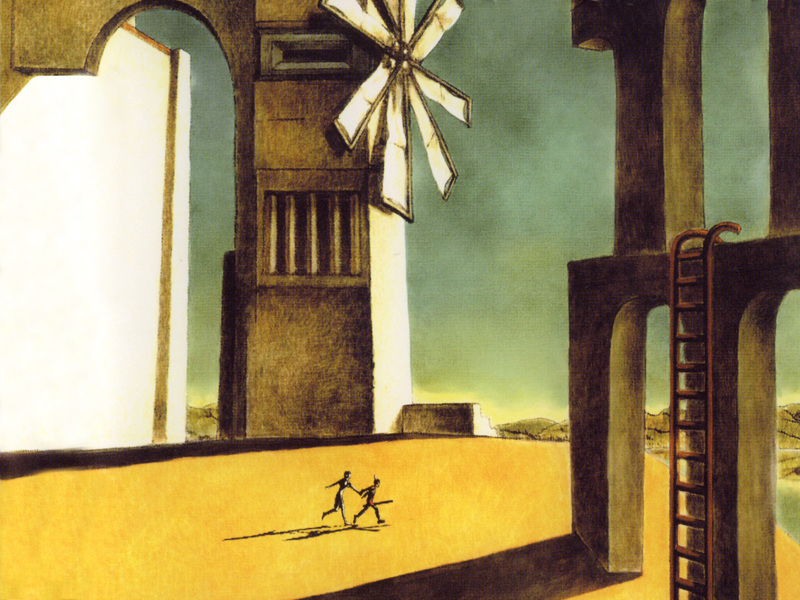 ICO starts with a horned young boy being imprisoned inside a castle. 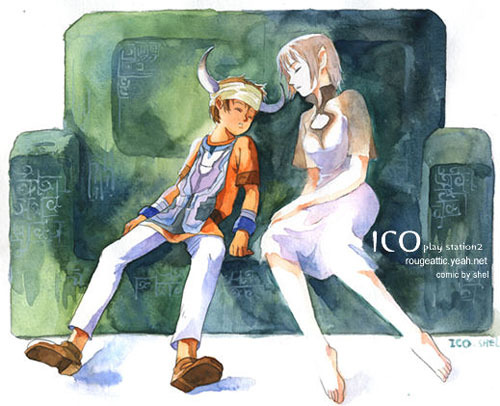 The game itself is basically his attempt at escaping from the castle, where the player has to solve puzzles and fight mysterious beings to protect a young lady that is also imprisoned in the castle. She ,in turn, has the power to open special doors. 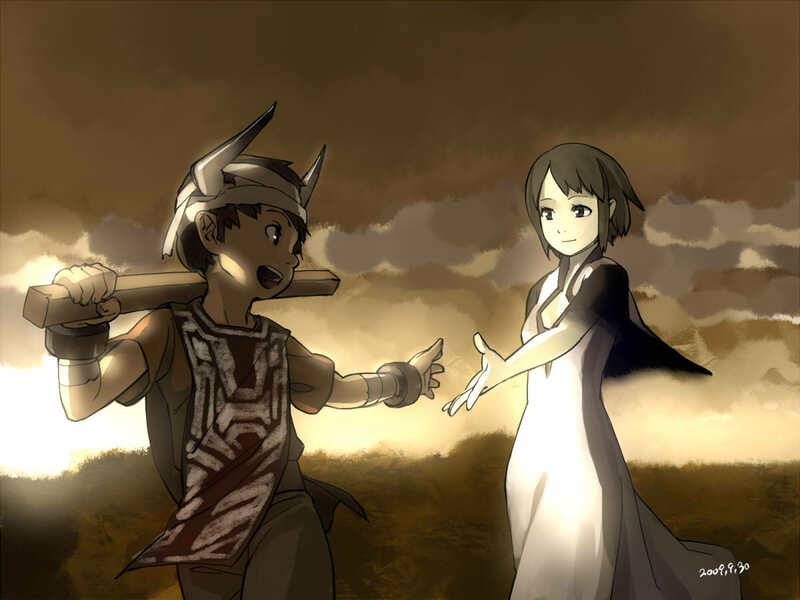 There's not much to say here, the boy finds the girl at the beginning of the game and finds out that she can open special doors. So then, they try to escape the castle. Since she can't jump, climb, and fall as well as the boy, the player will have to change the environment so that she can progress as well. She will be constantly under attack by "shadow creatures", so you have to stay on your toes. 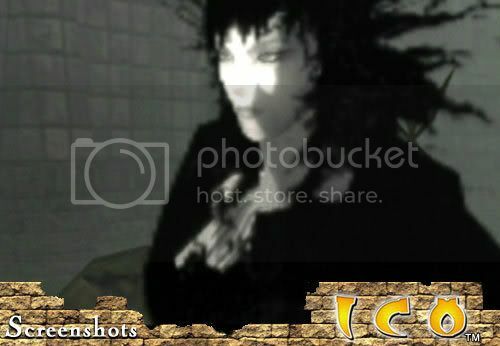 Halfway through the game the "queen" appears, and she looks like a combination of the girl with the shadow creatures. Obviously she doesn't want the girl to escape, but you won't know why until you reach the end of the game. In the game you can jump, grab things such as wood sticks, swords, bombs, etc, pull and push boxes, activate switches, grab the girl to take her with you and also call her to go near you. You will have to use this to create paths for the girl to progress across sections of the game, and you might need to help her jump across gaps by grabbing her or push her from a higher spot. The game isn't very difficult or very long and there's even a trophy to complete the game in less than 2 hours (even though it took me almost 7 hours to complete it on my first playthrough). The save system is also interesting because you can only save while sitting on special stone benches and you need to sit down with the girl to be able to do it. The attacks on the girls normally happen when they arrive at a new zone or when a puzzle is completed. Also, if the girl is left alone in a room for a long time or the boy gets too far away a spontaneous attack will occur. There are different types of shadow creatures, some climb walls and become "shadows" for a time, becoming immune to attacks, others are human shaped and some even fly. They will try to take the girl to their spawning points and start to dragging her inside. The boy will have to fight the creatures with his horns if he is unarmed, or with a stick/sword. If the creatures manage to take the girl to their spawning points the boy will have to push her out before she disappears and you lose. I think that the best word to describe this game is the word 'different'. The music is very calm and fits into the desolate castle perfectly. The puzzles are good and the whole boy/girl interaction is interesting. The controls aren't bad, with R1 you grab or call the girl, pretty much like in Shadow of the Colossus, where you use R1 to grab on to your enemies. The graphics aren't bad for a 2001 game and the overall ambience is pretty good. The end is amazing considering the type of game: the normal turn of events near the end, the well though last boss mechanics and the satisfactory ending make this game something that you should not miss if you're into a different type of game. Has a good level interaction with the environment. Amazing and beautiful castle design. Occasional pathfinding issues on the girl's AI. The back story could have been better explored, although it gives the whole game a nice, mysterious aura.